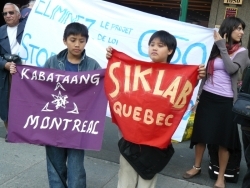 Demonstrators outside of Immigration Minister Diane Finley's speech in Montreal. On March 14, Canada's Conservative government introduced a series of amendments to the Immigration and Refugee Protection Act (IRPA). Instead of being presented as an immigration bill, the new reforms were slipped into Bill C-50, the 136-page "budget implementation bill" that pertains to this year's federal budget. The government launched an ad campaign in hundreds of ethnic newspapers, at a cost of $1.1 million, touting the measures while they were still before Parliament. In addition, Stephen Harper's government raised the stakes for any opposition by making the bill a confidence vote. If Liberal MPs had voted against the bill, along with the Bloc Quebecois and the New Democratic Party, it would have triggered an election. While all opposition parties condemned the changes, the Liberals abstained en masse to avoid forcing an election. On June 10, with the seats of 80 Liberal MPs empty, Bill C-50 passed into law. Vancouver resident, political science graduate, migrant justice campaigner, indigenous solidarity organizer and single mom Cynthia Oka notes that in spite of Citizenship and Immigration Canada's attempted infiltration of ethnic media for the purpose of defending the bill before it had even passed, there is opposition to be found in those same venues. "Grassroots immigrant communities are speaking out against the bill, but they're not finding voice through institutionalized channels. Some ethnic media are taking a decidedly more critical angle of the bill, which is encouraging." In Canada, there are three categories of immigrants: family class, independent or 'economic' immigrants (admitted on the basis of skill, capital and labour-market preferences) and refugees. Under the previous system, anyone who qualified to come to Canada would get in, though the process often took years. The new system will allow Immigration Minister Diane Finley and her department to prioritize some people over others. Applications that are not dealt with by the end of each year will be sent back. Under the new law, the minister has the right to reject an application without any court review, even after the established criteria have been met. The reforms will allow Finley and future immigration ministers to issue quotas and restrictions on people based on their particular categories and countries of origin. Humanitarian and Compassionate applications no longer have to be examined if the applicant is outside Canada. The minister also has the authority to decide the order in which the applications get processed, regardless of when they are filed. Audience members from Immigration Minister Diane Finley's speech emerge briefly to regard demonstrators. The result is a decision based on the needs of the employers and industry, rather than family reunification or human safety. Further reinforcing the standard of employability by which immigrants to Canada are reviewed, are the 'improvements' to the country's Post-Graduation Work Permit Program, which Finley announced in late April. Previously, foreign students studying in Canadian universities were allowed to work in Canada for a year (or two, in certain areas) after their graduation. Once they had acquired a year of work experience, they often had to return home since it was difficult for them to have their work permits extended long enough to allow their applications for permanent residence to be settled. Now, students who complete a program of study of two or more years at an eligible post-secondary institution in Canada can qualify to stay and work in the country for three years. Toronto immigration lawyer and columnist Guidy Mamann sums up the logic behind this extension. "Canada will have an immigration system whereby we can actually 'test-drive' the candidates before accepting them as permanent residents here." This move, contrary to popular belief, is not merely beneficial to foreign students, but is likely to further promote the gap between those who can afford the higher tuition fees reserved for out-of-country students and those who cannot. Finley's "improvements" also serve to emphasize the particular kinds of people her department deems worthy of permanent residency in Canada. A number of agreements signed in recent years signify an endorsement of indifference, prejudice and enmity toward migrants who do not fulfill their roles as labour market commodities. The Safe Third Country Agreement (STCA) was agreement implemented in 2004 between the governments of Canada and the US in which both governments committed to bar most refugee claimants at the US-Canada border in order to better manage the flow of migrants at their shared land border. The North American Security and Prosperity Partnership(SPP), implemented in 2005, mandates the arming of border guards and a forceful increase in the number of border security initiatives to keep Canada, US and Mexico borders "closed to terrorism yet open to trade." There has been an exponential increase in the Canadian budget for "security measures"--estimated at over $24 billion since 2001. According to NOII Vancouver, Bill C-50 and the STCA allow Canada to reject up to 40 per cent of people seeking asylum. Support for Bill C-50 came mainly from employer organizations and the business lobby. Critics say the Conservatives' treatment of immigrants sends the message that people without credentials and with lower income levels are far less likely to qualify for permanent residency in Canada, and if they do qualify they are often limited to being temporary workers in marginal, often abusive jobs where loss of employment can sometimes end in deportation. Canada has become an increasingly antagonistic environment for people from other countries who are seen as either a security threat or as an unwelcome foreign imposition. Public Safety Minister Stockwell Day announced on May 6 that the Canada Border Services Agency (CBSA) had arrested 45 people alleged to be in the country illegally. "This large-scale operation protects the integrity of our immigration program and reinforces the security and prosperity of Canada," said Day. "The government of Canada continues to take this issue very seriously and remains committed to ensuring that those who wish to live in Canada do so according to our laws and by respecting the proper legal channels." Canada's own history (and contemporary reality) of war, persecution and corporate exploitation of land also comes into play. 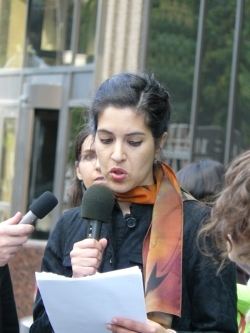 On June 4, while Finley was speaking at the Hotel Omni in Montreal, Samantha-Lee Chew Quinn of Montreal's South Asian Women's Community Centre (SAWCC) addressed a crowd of demonstrators who were denied access to the conference. "This cannot be said often enough. We are a country of immigrants, but we must also keep in mind that Canada as a nation has been built on the dispossession of the indigenous people. Canada owes its international reputation to all who dwell here but this minority government wishes to ignore the wishes of the people." 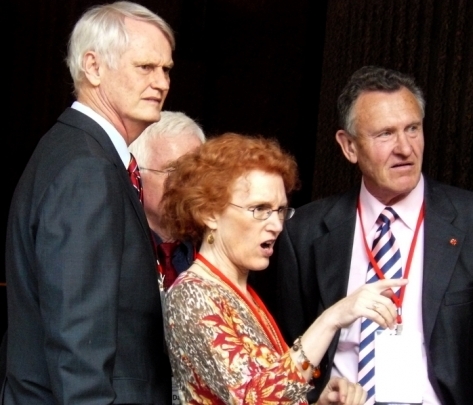 Journalists from The Dominion and Al Jazeera were barred from attending the conference. Select members of the press were granted access. On April 4, Finley addressed the House of Commons, claiming that, "We were able to welcome 430,000 new Canadians last year to this country, the highest in over 100 years." In fact, every year since coming to power, the Conservatives have reduced the number of permanent residents admitted to Canada. According to Liberal Citizenship and Immigration Critic Maurizio Bevilacqua, the government has cut the total number of people by 36,000 over the last two years. "This misinformation campaign is really hurting the credibility of the process," said Bevilacqua. While the percentage of permanent residents in Canada is decreasing, there is an increase in the number of temporary migrant workers without basic rights. In Canada today, the number of people admitted each year on temporary work visas is greater than the number admitted as permanent residents. Finley's newfound right to impose different migrant quotas on different countries has been compared to previous racist legislation, like the head tax that was once applied to all Chinese immigrants, or the Chinese Exclusion Act that was passed on Dominion Day, July 1, 1923. Until 1947, when the act was repealed, the Canadian Parliament excluded all but 50 Chinese immigrants from entering Canada. The Chinese-Canadian community viewed this law as the ultimate form of humiliation, especially given that Canada's attempts to restrict Chinese immigration to Canada began in 1885, with the completion of the Canadian Pacific Railroad (CPR) and the resulting shift in the needs of Canada's labour market. The Canadian Conservatives' racist Continuous Journey Law, passed to discourage Indian immigrants from entering Canada, was responsible for the Komagata Maru incident of 1914, where 20 people from India were shot dead by British authorities for challenging Canadian legislation. Ukrainian-Canadian internment, part of the confinement of "enemy aliens" in Canada during and after the First World War, kept about 5,000 Ukrainian men of Austro-Hungarian citizenship in internment camps. The Harper government has made announcements to acknowledge past injustices and compensate people both directly and indirectly affected by immigration policies of the past, but often to the dissatisfaction of many. For example, when the prime minister offered an apology in 2006 for the head tax once paid by Chinese immigrants and a redress of $20,000 for those who were alive at the time to pay it (an estimated 20 Chinese Canadians who paid the tax were still alive in 2006), many were critical of the apology. Peter O'Neil of the Vancouver Sun noted that “factions of the Chinese-Canadian community were set to do battle as the federal government announced a head tax redress plan that doesn't provide direct compensation to individuals, and their descendants, who suffered because of racist Canadian laws.” The Chinese-Canadian community continues to fight for an acceptable redress from the Canadian government. According to Oka, what is needed in order to counteract the duplicitous Bill C-50 is "a mass and visible response of people, organizations and communities saying, 'no.'" "A big part of that has to do with making immigrants, and the work they do, more visible. It is not a bill that is happening in a vacuum. It's happening in a context of securitization and hyper neo-liberalism. The war on terror, the Olympics, the tar sands--it's all connected, and C-50 makes perfect sense when considered in that web."